A brand new design, just in time for the cold days ahead!! The Effortless Chic Crochet Beanie is the second piece in the Effortless Chic Series!! This series is a Simple, Chic Style that will dress up your wardrobe with a fun, quick crochet design!! The first pattern in the series is the Effortless Chic Headband… Stop by and check it out!! Stay tuned in the next week for the 3rd pattern in this series!! If you love this project… You can add it to your Ravelry Queue and Favorites… Click Here!! 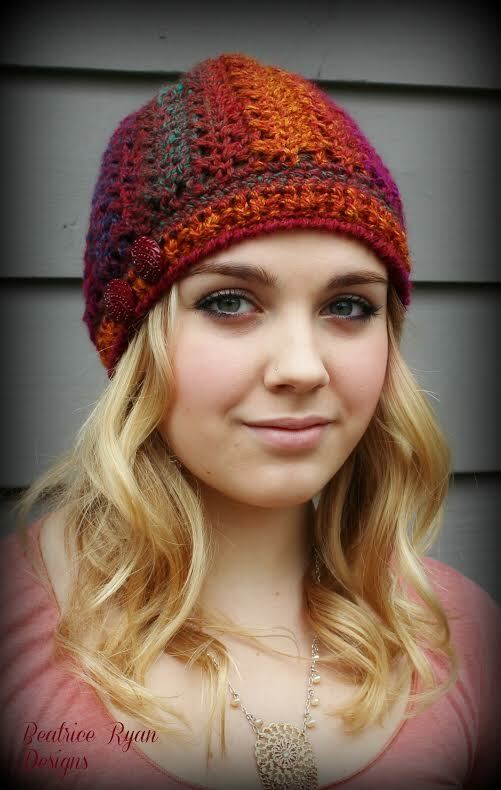 A Stylish Hat that is easy to make and is another 1 skein project!!! Buy Now… 5 pk and make the matching Effortless Chic Poncho!! *Tip, You will be making a rectangle to form the crown of the hat… Once the rectangle is complete, you will sew the ends together to form the crown of the hat. Then you will gather the top of the hat using a yarn needle to make an easy stylish top and the final step… you will make a brim using simple stitching. Rows 3-34: Repeat Row 2. Finish Off leaving a long tail to sew the hat together. This rectangle is approximately 21″ long and 8 1/2″ wide. If you need to make the hat smaller or larger, you can add or subtract the repeat of row 2. Sewing the crown of the hat together. With tail and yarn needle, Sew Row 1 together with Row 34, being careful not to gather the seam. Finish off and secure. Turn you crochet piece so that the seam is on the inside of the hat. You can choose either end of the hat to be the top. With a long piece of yarn and your yarn needle, gather the top of the hat by weaving in and out of the row ends and drawing it tightly together. Sew the gathered area with a few stitches to secure the top of the hat. Weave in ends. *You will be working in the round and your first row will be made in the ends of the rows from the crown of the hat. You will have 33 row ends form the crown base of the hat, row 1 of the crown will not be in this count as it was sewn together to form the crown of the hat. With right side facing and the bottom of the hat upwards, Join the yarn with a Sl St to any row end space. Row 7: Ch 1, Rev Sc in each St around. Join to beginning. = 66 Rev Sc. Sew 2 Fancy Buttons on to the brim . As usual… Charlie insisted on photo bombing our photo shoot!!! And…Thanks to my lovely model and youngest daughter Mackenzie for showing off my latest design!! Your designs are wonderful. Directly after the Christmas season has ended I see my new year commencing with your patterns. I have arthritis so with braces on my wrists I crochet. Your will keep me limber. I keep seeing this beanie everywhere I look and love it! I’m going to share it on my Facebook page. Keep up the great work and happy crocheting! I made your Effortless Beanie for niece and I loved making it. I found your instructions clear and precise. I used a different yarn, some that I had left over from a shawl. I think that it turned out rater well! Keep those lovely patterns coming! I will try to add a picture to your facebook page so you can see it.